These small pocket computers were derived from the PC-1251. They had same keyboard and size. The main difference was the larger display, which now provided two lines with 24 characters, which was a great advantage, especially for BASIC programming. The built-in BASIC interpreter was also close to the PC-1251 interpreter. In 1984, the PC-1260 and PC-1261 were released. The only difference between these two was that the former had 4 KB RAM and the latter 10 KB. Internally, they were operated by the SC61860 CPU (8 bits), which was clocked 33% faster than in the PC-1251. The CPU was mounted on the main PCB, together with the two display driver chips SC43536. Memory was incorporated on a second small PCB. The PC-1260 had the SC613256 ROM plus two HM6116 8K x 8 RAM ICs. The PC-1261 had the same ROM, but five "naked" RAM chips, i.e. chips without DIL case, mounted directly onto the PCB. Two years later, the PC-1261 was re-released as the PC-1262. It was identical in functional terms, but had a different case color scheme. Internally, it was based on the same main PCB, but the memory PCB was now equipped with a SC623257 ROM, a HM6264 8K x 8 RAM, and a LH5116 2K x 8 RAM. 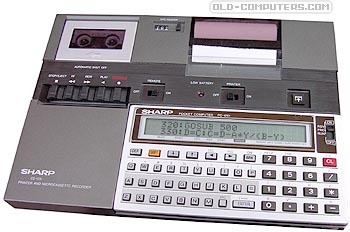 The picture represents a PC-1261 mounted on a CE-125 micro cassette recorder and thermal printer unit. Information provided by Roman von Wartburg. see more Sharp PC-1260 PC-1261 PC-1262 Ebay auctions !